The Brooklyn Night Bazaar will return permanently to Greenpoint this year on Friday and Saturday nights. The Woodstock of culinary adventurism moves from DUMBO to Pier 5 in Brooklyn Bridge Park. The Great GoogaMooga's greatness continues to be in question, and it won't be returning to Prospect Park in 2014. Just where it ends up - or if it ends up being held at all - we don't yet know. The glass encased Whole Foods in Williamsburg will be the healthy food giant's second location in Brooklyn after the Gowanus Whole Foods opens later this year. Another Japanese-Jewish combo comes this way! Such a pairing seems to be gaining traction in Brooklyn with other spots too, like Dassara Ramen, which serves Matzo Ball Ramen. Uinta’s Baba Black Lager will change what you think about larger (it's not Bud), with a peek into the Bushwick bar Three Diamond Door. 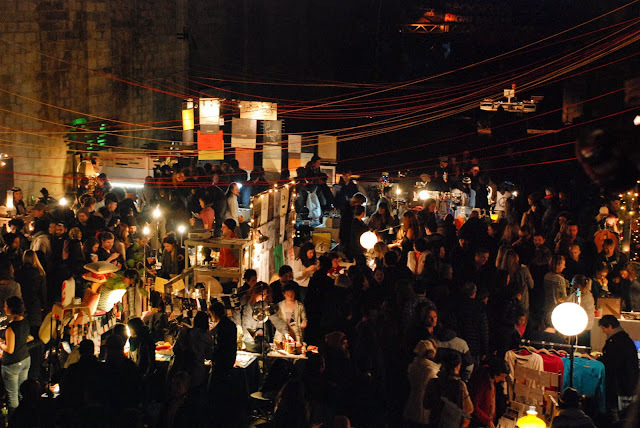 After a successful run of the Brooklyn Night Bazaar last year, the Night Bazaar will return weekly on Friday and Saturday nights until midnight, with food vendors, crafts, rock climbing and table tennis too. Food from Pok Pok, Roberta's Luke's Lobster and more will all be there to fill you up!